How did you end up becoming an embroidery artist? James Merry: I’ve always loved embroidery – the first thing I embroidered was a little canvas bookmark, aged about eight, and then I would embroider birthday presents for my friends at university – but the realisation that I can do this for a living was a very recent one. 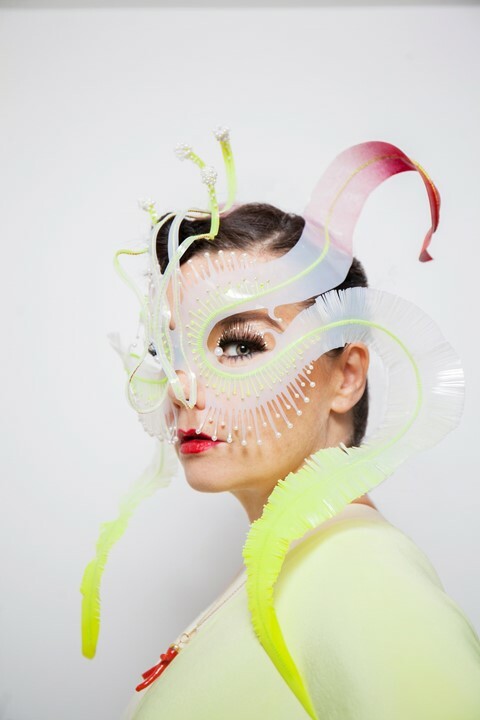 It was only really when Björk and and I started working on Vulnicura, and one of her instincts, aesthetically, was to include embroidered Icelandic plants, that my ears pricked up. The first thing I made was a pair of embroidered stockings for her to wear in the “Black Lake” video, and then it just snowballed from there. I started making headpieces after that, and then began making my own sweaters. What’s the design process like when you begin a piece of embroidery or a headpiece – do you make drawings or prototypes? James Merry: No (laughs). There’s absolutely zero planning, it never works for me. They’re all handmade – I never use machines – so it always tends to be a spontaneous reaction to a material I’m working with. With the headpieces, for example, I’ll take whatever material I’m using and bend and twist and play with it for hours and hours, days and days until I start finding something interesting. It was actually only when we were making the video for “The Gate”, in collaboration with Gucci who made the dress, that I’ve ever had to do sketches and prototypes. I found it really difficult because I never know how anything’s going to turn out until I start it; I think it with my hands, but it was an interesting process. I loved working with Gucci and I’m really proud of the headpiece because I had to perform quite a delicate balancing act to make it fit alongside a dress that was spectacular in its own right. You’re almost entirely self-taught, is that right? James Merry: Yes, pretty much. With the embroidery I watched a few YouTube videos when there was something technical I didn’t know how to do and I have a couple of big stitch bibles, but my approach has always been very instinctive; I like being an explorer more than a pupil. At first, being self-taught, you automatically have imposter syndrome – you’re just waiting for someone to go, ‘What the hell does he think he’s doing?’ But I’ve gone for it now and am happily finding my own way forward. I think you come up with your own idiosyncratic way of working with a material if you’re not forced into these little prescribed routines. That was very much the case for the silicon facepieces we’ve been using for Utopia. We were staying in the Chateau Marmont in LA, doing the shoot for “The Gate”, and I bought loads of silicon and weird materials that I’d never worked with before, locked myself in my room for two days, and set up what looked like a meth lab in the bathroom. I think the cleaners thought I was building a bomb! I wouldn’t let them come in and, when they did, there were jars and chemicals all over the floor. How does Björk approach the research process for a new album? James Merry: So much of it is about instinct and emotion rather than being intellectualised or over-thought, especially when she’s forming a soup around an album. That’s the most exciting part of the project, I find, when she’s just slowly building up to the next thing, maybe before she’s even recorded any music, and she has these really strong instincts and precise references – aesthetically, musically and emotionally. I end up almost like a little magpie, with my eyes and ears trained on zooming in on ideas that fit with hers, and then we’ll share them back and forth. Interestingly, from a visual point of view, you can sometimes see at the end of one album or tour, she’ll start wearing something that’ll overlap with the next one. What shape do her references tend to take? James Merry: They’re totally varied: things from nature; things she’s found online somewhere; a corner she’s ripped out of a magazine. She’s very rarely drawn to things that are in the middle ground. They’ll be really extreme – extremely romantic and gorgeous or extremely alien and sci-fi or extremely technologica – but always a really nice palette of stuff to be inspired by. How about the inspirations behind Utopia? James Merry: The Utopia references had quite clear-cut colours early on – this peachy colour, and this greeny turquoise-y colour – and a lot of floral stuff, a lot of orchids; not pretty flowers, more alieny, sci-fi looking flowers. It’s all quite sexual and sensual. I saw it as a chance to make pieces that were totally different from the embroidered ones – I think I made about 20 embroidered headpieces for the previous project – which is why I started experimenting with silicon. It seemed to fit the palette that she was getting into; it felt more sci-fi, kind of like prosthetics, and also sexual. And it was also just exciting to try and find new ways to put stuff on the face. Was silicon difficult to master? James Merry: I still haven’t mastered it! I’ve got a lot better since those first ones in LA though. We shot a new video and I had to make a lot of new pieces. I’m just learning how to make them more refined – thinner and easier to wear. I had to make them for 11 flute players, as well as Björk, for something we did recently so I had to churn them out in different colours and configurations. I have boxes and boxes of them. I really enjoyed doing the mouthpiece for her to wear on the W magazine cover – trying to distort the mouth into an orchid. What’s been the most important creative lesson that Björk’s taught you? James Merry: Working with her has been so formative for me as a person, besides being an artist. But I think the biggest lesson is a really respectful way of treating other people – being able to give them the space to be themselves but still feeding them and nourishing them, and allowing yourself to be nourished by them. I think before I met her I was always a bit overwhelmed by my instincts – if I was into something I’d just want to go straight into it and consume it. That’s still the case, to a degree, but from Björk I’ve learnt a lot about doing things gracefully, with respect and tenderness.